This past week I wrote about Skype (s msft) competitor OoVoo, which launched a new Facebook (s fb) 12-way video chat app along with updateds to many of its other apps. While the Facebook app was the headline, what really stood out to me was my conversation with OoVoo chairman Robert Jackman. Jackman told me that OoVoo’s mostly young users — 60 percent of its 46 million users are under 25 — don’t use OoVoo like other people use Facetime (s appl) or Skype: to make the equivalent of a phone call over video. 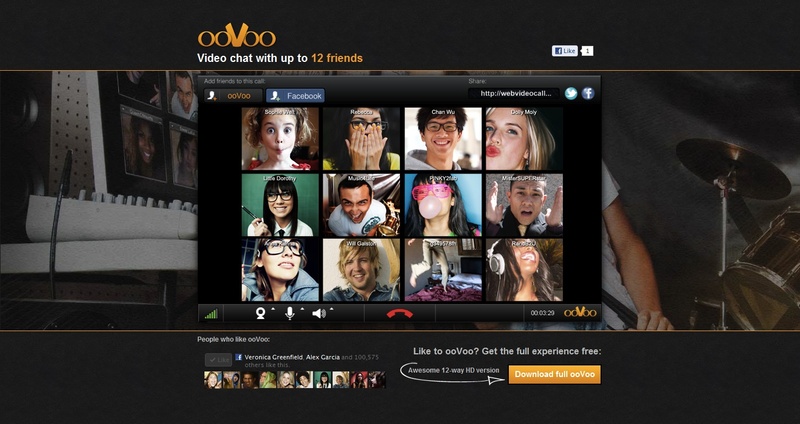 Many simply come home and leave OoVoo on in the background as they do homework or watch TV, sort of like an instant messager app. Friends jump on or jump off, checking in with each other and seeing what’s going on. The person who starts the video chats isn’t obligated to stay on. This is not appointment video: it’s ambient video, running in the background. That got me thinking about the evolution video. It’s similar in some sense to how pictures have undergone a transformation. We used to take pictures to preserve memories, using precious film to capture significant moments. But with advent of digital cameras and later mobile phones with cameras, pictures became akin to a casual form of communication, giving rise to services like Instagram and others. Video chatting and broadcasting is also evolving in a similar manner. We used to think about scheduling Skype chats and video conferences. Uploading a video to YouTube (s goog) meant you often edited the video or at least reviewed it. But now, we’re seeing that video is becoming this casual, immediate medium that doesn’t have to convey anything special. Jackman believes the rise of ambient video is due to cheaper broadband and the growth of free services that allow users to use video with little regard to cost. The fact that video chatting can increasingly be multiparty also lends itself to this idea of video as an emerging background layer to life. Google is seeing more people leave Google Hangouts on for long periods of time, according to Iska Hain, a company spokeswoman. “We definitely see that use case, especially at Google where colleagues will jump into a Hangout from remote offices and we all do work together. Sometimes people do like to just ‘be around’ other people. There are cases of folks turning a hangout on while they go about cooking or knitting or painting,” Hain said. Foursquare has set up a big screen video portal inside both of its New York and San Francisco offices that are constantly on, allowing people to see each other and organize impromptu meetings. “I can just go up to the screen and shout someone’s name and they’ll come to the portal,” said Benjy Weinberger, Foursquare’s San Francisco engineering lead. 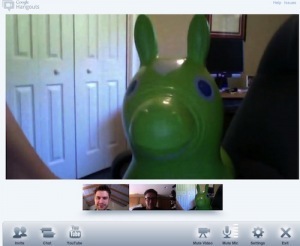 It’s not just with video conferencing. People are increasingly more casual with video sharing as well. I was reminded of this when talking to Bill Nguyen, the co-founder of Color. Color, as we wrote recently, has signed a deal with Verizon (s vzw) to put its live video-sharing app on Verizon phones. The app allows users to start recording a video and alerts their friends that a live broadcast has started. When I first heard about that, I wasn’t comfortable with the idea of sending out video before having the option to edit it. I don’t have any idea what’s going to happen at the end of that clip. But that’s where things are going. We’ve seen that with other live-streaming services: people are increasingly comfortable broadcasting their lives and letting the world see whatever happens. Gil Eyal, vice president of marketing for Mobli, a mobile photo and video sharing service, said increasingly people are just uploading videos directly to the service without editing out mistakes or taking a look again at what they’re showing. Not everyone is ready for this kind of spontaneous, always-on video world. But it’s a natural extension of the trends were seeing in technology and social media. The barriers separating the private and the public are crumbling thanks to social and technological tools that make it easy to share. The same ideas at work behind Facebook, Foursquare and Instagram, will also spur people to be more open and free with video. Image courtesy of Shutterstock user Tyler Olsen. How can I flow an movie from any point?Well, I was viewing a lengthy (43 mins) movie when my relationship split. I reconnected and I had to load the the site, and now I have to barrier the movie from the beginning again, and I’m not individual enough to delay.Is there a device that can help me begin internet a movie from any given factor (e.g. beginning from 20 mins)?? Great for connecting families too. Online videos are a better way to communicate and are entertaining and interesting as well. Free video sharing apps make the task all the more easy. Great until your ISP bandwidth cap kicks in. Online videos are more popular among the youth. Now people spend more time in watching online videos, than viewing television programs.